The Manor01873 810212work01873 811938fax HotelHigh on the side of the Black Mountains looking down the Usk Valley in the heart of the Brecon Beacons is The Manor Hotel and Restaurant. The Manor Hotel dates back to the early 1700’s, comfortable in its history and design, guests feel immediately relaxed in its environment. 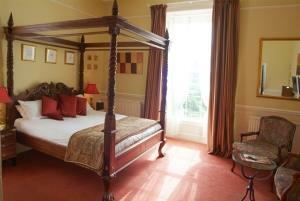 We have 22 ensuite bedrooms, all with satellite TV and direct dial telephones. Many have breathtaking views over the Usk valley and provide the comfort and facilities expected by the business traveller and families alike. There is a leisure suite with fully equipped gymnasium and pool, a ballroom with seating for up to 200 people, relaxing bar area, terrace room, the Everest restaurant, conference facilities and best of all - the fantastic views. High on the side of the Black Mountains looking down the Usk Valley in the heart of the Brecon Beacons is The Manor Hotel and Restaurant. The Manor Hotel dates back to the early 1700’s, comfortable in its history and design, guests feel immediately relaxed in its environment. Licensed for civil marriages. Children welcome from any age. Travel on the A40 through Crickhowell Town, 200 yards past the white heart Pub and we are located on the right you can not miss us.